BOSTON (March 23, 2017) - The 122nd Boston Marathon on Monday, April 16, 2018, and surrounding Marathon-related events including the John Hancock Sports & Fitness Expo and the B.A.A. 5K, will bring an estimated $201 million (USD) in spending impact to the Greater Boston region, according to Greater Boston Convention & Visitors Bureau (GBCVB) President & CEO Patrick Moscaritolo. Held annually on Patriots’ Day, the Boston Marathon is the world’s oldest consecutively run marathon and ranks as one of the world’s most prestigious road racing events. The Boston Athletic Association (B.A.A.) has managed and organized the Boston Marathon since the event’s inception in 1897. This year, there will be 30,000 official participants in the Boston Marathon, including more than 7,100 runners traveling from 96 countries outside the United States. 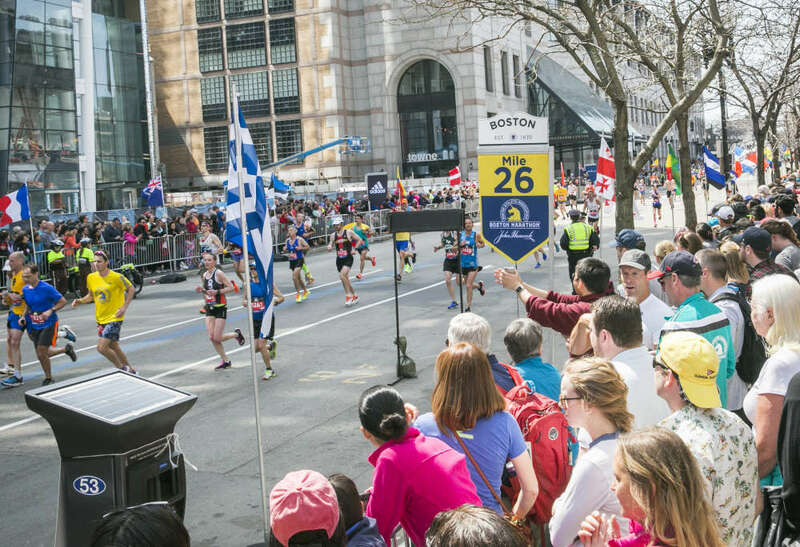 In addition, over 1,000 members of the media from more than 200 outlets are expected to cover the Boston Marathon, providing the Greater Boston region with unparalleled international exposure. The 2017 Boston Marathon generated $192.2 million (USD) and had an entry field of 30,816 athletes. For the 33rd consecutive year, the principal sponsor of the Boston Marathon is John Hancock Financial. John Hancock Financial provided the first-ever prize purse for the Boston Marathon in 1986 and has provided over $19 million (USD) in prize money for the event. This year’s prize purse totals $830,500 (USD), plus bonuses. The John Hancock Sports & Fitness Expo will be located at the Seapor World Trade Center at 200 Seaport Boulevard from Friday, April 13, through Sunday, April 15. This year’s Expo opens on One Boston Day, a day that celebrates the resiliency, generosity, and strength demonstrated by the people of Boston in response to the tragedy of April 15, 2013. The Expo is widely regarded as the running industry’s premier expo for new products and services, features more than 150 exhibitors, and is estimated to attract more than 100,000 attendees. Boston Marathon participants must claim their bib numbers for this year’s race at the John Hancock Sports & Fitness Expo. Also among 2018 Marathon-related events is the B.A.A. 5K on Saturday, April 14, two days prior to the Boston Marathon. The B.A.A. 5K will feature 10,000 entrants, including 1,132 international participants, and registration concluded in January. The 3.1-mile course starts and finishes at historic Boston Common and takes participants across the Boston Marathon finish line. Established in 1887, the Boston Athletic Association is a non-profit organization with a mission of promoting a healthy lifestyle through sports, especially running. The B.A.A.’s Boston Marathon is the world&apos;s oldest annual marathon, and the organization manages other local events and supports comprehensive charity, youth, and year-round running programs. Since 1986, the principal sponsor of the Boston Marathon has been John Hancock Financial. The Boston Marathon is part of the Abbott World Marathon Majors, along with international marathons in Tokyo, London, Berlin, Chicago, and New York City. More than 60,000 runners will participate in B.A.A. events in 2017. The 121st Boston Marathon will be held on Monday, April 17, 2017. For more information on the B.A.A., please visit www.baa.org.